The White Line of Via Dinarica offers interested visitors the opportunity to get well acquainted with diverse natural values of Croatian mountains by taking a longitudinal tour of the mountain area. Following the layout of the Dinarides, the White Line links the most attractive Croatian mountains, peaks and viewpoints, using the infrastructure of the most popular hiking tours of Croatia (Gorski Kotar Hiking Trail, Kapela Hiking Trail, Velebit Hiking Trail). The White Line reaches its highest point on the mountain of Dinara – the mountain with the highest peak of Croatia, and also the mountain that gave the Dinarides and the Via Dinarica trail its name. 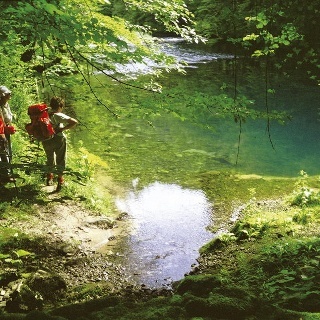 Providing an extraordinary opportunity to explore the very heart of the Croatian Dinarides, the White Line connects all three mountain national parks of Croatia, both Croatian strict nature reserves, and the largest nature park in the country. The White Line is recommended to experienced and well equipped mountaineers. The best time of year to visit the trail is the summer period, since trail sections in the region of Gorski kotar, the peak area of Velebit and the mountain of Dinara are covered in snow in wintertime, with snow sometimes remaining in the area until late spring. From the direction of Snežnik in Slovenia, the White Line enters Croatia at the border crossing point Babino polje / Prezid. After the cessation of the Schengen border procedure at the border between Croatia and Slovenia and following some other preconditions, the idea is to move the White Line route of Via Dinarica to the route of what was once the Snežnik – Snježnik path. Through most of the region of Gorski kotar, from Prezid to Bijele stijene, the White Line follows the route of Gorski Kotar Hiking Trail (Goranski planinarski put), with the exception of a brief connecting section between the village of Razloge at the source of the Kupa River and Crni Lug in Risnjak National Park. The trail visits the mountains of Tuhobić, Bitoraj, Bjelolasica and the locality of Samarske stijene and Bijele stijene. In the area from Bijele stijene to Kolovratske stijene, the White Line fully follows the route of the Kapela Hiking Trail (Kapelski planinarski put). In the area from Kolovratske stijene to Vratnik, and further to the Northern Velebit National Park, the White Line follows the route of what was once the Kapela – Velebit connecting path. This path is no longer maintained, but the old route is not hard to follow, especially in the area of Senjsko bilo on Velebit, where the hikers from Senj prepared the Senj Trail (Senjska obilaznica). On the mountain of Velebit, Via Dinarica follows the route of the Velebit Hiking Trail (Velebitski planinarski put). In the area of northern and central Velebit, the central part of the White Line route is the famous Premužić Trail, with climbs to attractive peaks near the trail readily available as an add-on to the regular tour. In the area of Paklenica National Park, the White Line takes hikers next to the highest peaks of Velebit (Vaganski vrh and Sveto brdo), continuing to the southeast towards Tulove grede and Crnopac, descending to Gračac and Cerovačke Caves, arguably the most beautiful caves in Croatia. In the elevation zone between Tulove grede and Prezid, the White Line is briefly interrupted due to mine suspected areas. In continuation of the route, from Gračac to Knin, the main direction is defined by the D1 state road. In order to avoid the 55-kilometer long road section, the trail links various attractive sites with development potential (southernmost slopes of Velebit, Poštak hill, source of the Zrmanja River, Oton hill, etc.). Prior to Knin, the Promina branch of Via Dinarica White Line climbs across the Krka River towards Promina, and then proceeds further across Kijevski Kozjak towards Vrlika and Cetina, where it reconnects with the Via Dinarica White Line. 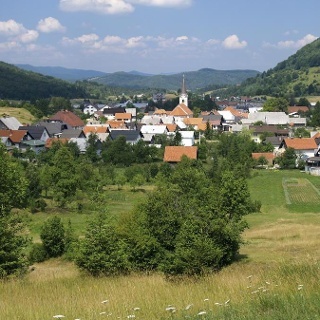 Due to the unique characteristics of the mountain of Dinara, which gave the entire Dinarides and the Via Dinarica trail its name, the White Line branches into three route options in the area of Dinara, from Knin to the southern edge of Kamešnica. From the hiking point of view, the most attractive option is the elevated Troglav route, leading along the peak zone of Dinara, Troglav and Kamešnica (the so-called "Operation Storm Trail"). Due to the demanding terrain, limited accommodation options and water supply, and the impossibility of crossing the state border in higher elevations, there are also two alternatives to this particular option available in the area of Dinara – the Livno route (across the mountain pass and border crossing point of Strmica) and the Cetina route of the White Line (down the Cetina River towards Sinjsko polje). From Knin and across Dinara, the White Line follows the imagined lengthwise tour of the mountain od Dinara to the source of the Cetina River, where the trail connects with the Promina route and separates from the Troglav route. In continuation, the Cetina route of the White Line follows the course of the Cetina River downstream along the shores of the lake of Peruča to the edge of Sinjsko polje. From the Peruča Lake onwards, the trail continues along the pilgrimage Route of Our Lady of Sinj, which brings the White Line to the state border with Bosnia and Herzegovina at the border crossing point Aržano – Prisika.